Closure of the gastrotomy, when performing transgastric procedures, is one of the most challenging steps. Several methods of gastric closure have been described in the literature but to date there is still a lack of a rapid, simple and effective device. 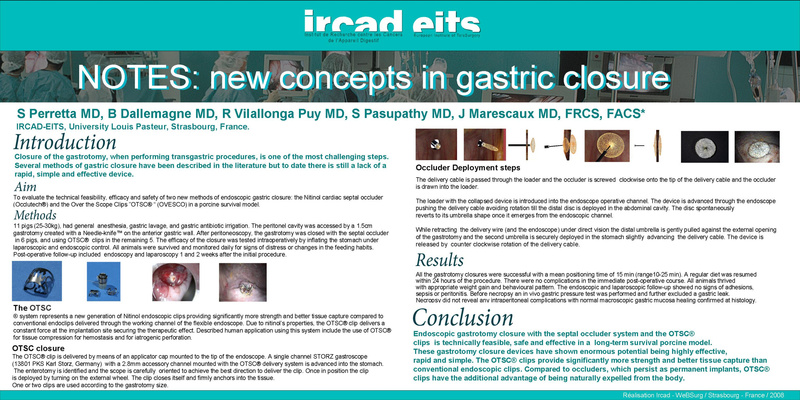 The aim of this study was to evaluate the technical feasibility, efficacy and safety of two new methods of endoscopic gastric closure: the Nitinol cardiac septal occluder (Occlutech®) and the OTSC® clips (OVESCO) in a porcine survival model. 11 pigs (25-30kg), had general anesthesia, gastric lavage, and gastric antibiotic irrigation. The peritonel cavity was accessed by a 1.5cm gastrotomy created with a Needle-knife™ on the anterior gastric wall. After peritoneoscopy, the gastrotomy was closed with the septal occluder in 6 pigs, and using OTSC® clips in the remaining 5. The efficacy of the closure was tested intraoperatively by inflating the stomach under laparoscopic and endoscopic control. All animals were survived and monitored daily for signs of distress or changes in the feeding habits. Post-operative follow-up included endoscopy and laparoscopy 1 and 2 weeks after the initial procedure. All the gastrotomy closures were successful with a mean positioning time of 15 min (range10-25 min). A regular diet was resumed within 24 hours of the procedure. There were no complications in the immediate post-operative course. All animals thrived with appropriate weight gain and behavioural pattern. The endoscopic and laparoscopic follow-up showed no signs of adhesions, sepsis or peritonitis. Before necropsy an in vivo gastric pressure test was performed and further excluded a gastric leak. Necropsy did not reveal any intraperitoneal complications with normal macroscopic gastric mucosa healing confirmed at histology. Endoscopic gastrotomy closure with the septal occluder system and the OTSC® clips is technically feasible, safe and effective in a long-term survival porcine model. These gastrotomy closure devices have shown enormous potential being highly effective, rapid and simple. The OTSC® clips provide significantly more strength and better tissue capture than conventional endoscopic clips. Compared to occluders, which persist as permanent implants, OTSC® clips have the additional advantage of being naturally expelled from the body.